On the 3rd day of Christmas my true love gave to me Tooommm Frost! 1. There's a Jack Frost, why not Tom Frost too? 2. The man nearest and dearest to my heart is named Tom. 3. Tom Frost happens to be one of my modern day climbing heroes. Tom is a rock climber from California and one of the first pioneers of the sport. His achievements included ascents of the magnificent monoliths in Yosemite, including the famous Salathe Wall on El Capitan, and ascents in the Himalayas alongside an impressive league of brilliant climbers such as Warren Harding, Royal Robbins, Yvon Chouinard, and Edmund Hillary. Not only is Tom a stellar climber and photographer, he is also an advocate of environmental ethics in climbing and worked hard to help preserve, respect and protect the natural environment that gave him so much enjoyment in life. Tom is now in his 70s. He is still climbing. And he is still one of my heroes. Tom Frost is a very personal creation. I suppose that there has been a rather strong inner voice tugging at me...a voice that says the mountain is calling and I yearn (at times too desperately) to be back up there. The mountain is a place like no other on earth, for me. It is where I feel most in my element and always happiest. I am an amateur climber, but an avid one. Lately, I've been feeling an immense urge to get back on the rocks and the mountains. But, everything has its time and place and now appears not to be the time or place for me. So, I created Tom. Tom is one of "the most kind, gentle and generous little boys you will meet, with never an ill word to say of anyone. He is also a boy filled with courage and leadership and possesses the true spirit of climbing." Winter is here in his part of the world and he is set and ready to get out for adventurous days in the cold, stark air. Tom is a Wee-Bee Mini Elfcup doll. He stands less than 6" (15 cm) tall. He is made with all natural materials. His doll skin is made with premium quality cotton jersey imported from Europe. He is firmly stuffed with bio-wool made in Oregon. His seams are sewn twice for reinforcement. His hair is made of a mohair-silk blended yarn and was hand sewn strand by strand directly onto his head to achieve a buzz-cut look. He has an embroidered and simple facial expression but also an easy going and pleasant demeanor. His cheeks, nose and various body parts are blushed with red beeswax. He is a sitting doll with sewn joints that are made flexible for easy movement and changing of clothes. He has a little belly button and even a bum. Tom comes wearing a blue striped hand-knit beanie made of Isager 100% alpaca yarn. He wears a simple long sleeve cotton shirt and grey cotton-polyester pants. His mountain boots are hand knit using a 100% wool yarn. His rope is hand knit with Isager 100% alpaca yarn and measures about 24" (61 cm) long. His ice axe is needle felted with 100% wool. Tom is recommended for ages 4+. 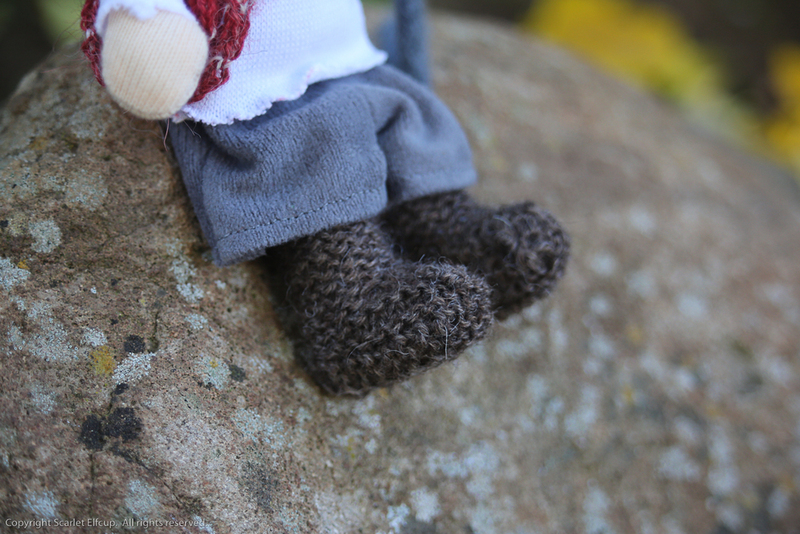 If you are interested in bringing Tom home to surprise a little girl or little boy who is aspiring to be a climber and would like a companion to follow in their pocket as they scurry up the rock wall, Tom is now available in the Etsy shop.